Hydro Mulching Services in Houston l Dirtwirx Inc. If you’ve never seen hydro-mulching (hydro-axing) in action, it is a sight to behold. Like a huge paper shredder, the hydro-ax turns trees into mulch from the top down, right where they stand. This method is extremely effective and allows us to cover a very large area. The wood chips produced by the hydro-ax are left where they fall, acting as erosion control and soil management. Cutting down the tree, cleaning up the branches and mulching the wood feels like the stone-age in comparison. However, hydro-axing is most suitable for large tracts of land because of the flying wood chips and the size of the machine. Did you know that overgrown land is less appealing to buyers? If you’re looking to sell off a plot of land, it’s a good idea to keep the place looking clean. And one of the important ways to do that is to selectively clear out trees and shrubby undergrowth, making the area look more open and cleaner. Even the most sophisticated lawn mowers aren’t effective against acres of woody overgrowth. But you don’t have to be selling land to benefit from hydro-axing. Periodically removing trees improves the health of the trees left standing, as there is less competition for water and nutrients. It also thins out the canopy, letting more light shine on an area. You can potentially increase the grazing land for your cattle, for example, by removing trees and making it possible for grass to flourish. And hydro-axing is the preferred method of tree removal due to its sheer power and capability. Conventional tree removal is at least a three-part process, requiring a planning stage (to determine where the tree should fall), the actual felling of the tree, and then cutting the trunk into sections in order to stack as firewood or to run through a mulcher. Hydro-axing combines the felling and mulching stages into one. In a matter of seconds, an entire tree—up to 12 inches in diameter—will be laying at your feet in a million little pieces. This works particularly well to quickly carve out a walking trail on your property, as the mulch provides a nice footing and a clear delineation of the path. It’s as if the hydro-ax machine enters an untamed area and leaves a manicured path in its wake. So for hunting access roads or walking or riding trails, hydro-axing is a great alternative to more labor- and time-intensive methods. Hydro-axing is an incredibly efficient way to control invasive species, which is crucial for the management of parks and nature preserves. Invasive species grow quickly and aggressively, crowding out native plants. Despite its size, a hydro-ax is precise enough to remove one tree while leaving its neighbor standing, allowing us to selectively remove invasive species but leave desired trees untouched. In fact, hydro-axing turns nuisance plants into something beneficial. Invasive species drain precious water and nutrients from the soil at alarming rates, starving out other plants. However, once they hydro-ax turns these intruders into mulch, the mulch has a protective effect on the remaining plants. Mulch keeps the soil cooler, helps keep the soil moist for longer periods of time and also helps the soil retain nutrients that would otherwise be washed away by the wind or rain if the soil were left exposed. No outside materials have to be brought into the park or nature preserve to achieve this. It’s therefore a highly efficient, practical and cost-effective way to kill two birds with one stone: removing the nutrient-stealing invasive species and putting a thick, protective layer of mulch on the surrounding area. Because invasive species tend to grow so fast, it’s best to have hydro-axing performed at intervals of about 5 years or so to keep the populations under control. For best results, hydro-axing is best paired with our professional stump grinding service, which will help make sure the trees truly cannot return. In Texas, the number-one invasive tree is the cedar (ash juniper). It has been reported that cedar trees can take up to 33 gallons of water per day out of the soil, and in a time of ever-increasing drought, the tree is not viewed favorably for that reason alone. Cedar is also considered to be a fire hazard due to the flammable oil in the wood. This oil can increase the intensity of a wildfire, turning it into a raging blaze. Cedar is low in nutrients, cattle find it unsavory and its excessive water and nutrient consumption halts the growth of native grasses, making it the bane of cattle ranchers across the state. Once cedar trees go to seed, they spread thousands of seeds throughout the area. And because cedars can grow (and thrive) in virtually all soil types and growing conditions, most of those seeds will turn into saplings and then into large, overbearing trees. With that said, cedars are still important for the ecosystem and certain bird and insect species in a few areas of the state, so in some cases there are limits on how many (or what percentage) of cedar trees can be removed from an area. The cost of hydro-axing can be limiting if you only need a few trees cut down. In that case, it may be more practical and economical to use another method of tree removal. However, the opposite is also true: if you have a large number of trees that need to come down, hydro-axing is the best deal around. Hydro-axes also cannot tackle all sizes of trees. Trees with diameters of 12 inches or less are ideal for a hydro-ax. Also, the hydro-ax needs to be able to reach the top of the tree or at least reach a diameter that is small enough for the blades to slice through. In the case of very large cedar trees, where a hydro-ax may not be the most appropriate tool, we can remove them in a way that makes it possible to use the cedar as lumber if desired. Hydro-axes are large, powerful pieces of equipment, and although there are some smaller versions out there, most aren’t going to fit in small spaces. The wood chips that fly out of a hydro-ax make it impractical for use in suburban areas where such shards and splinters could be dangerous to passersby. The bottom line is that a hydro-ax is an excellent piece of technology to make quick work of large, overgrown areas. Whether you need to get rid of trees or undergrowth, a hydro-ax shreds anything that gets in its way. The cost of a hydro-axing project depends on the size of the area to be covered and the amount of trees that need to be mulched down. However, the larger the area, the more cost-effective hydro-axing is thanks to its efficiency. 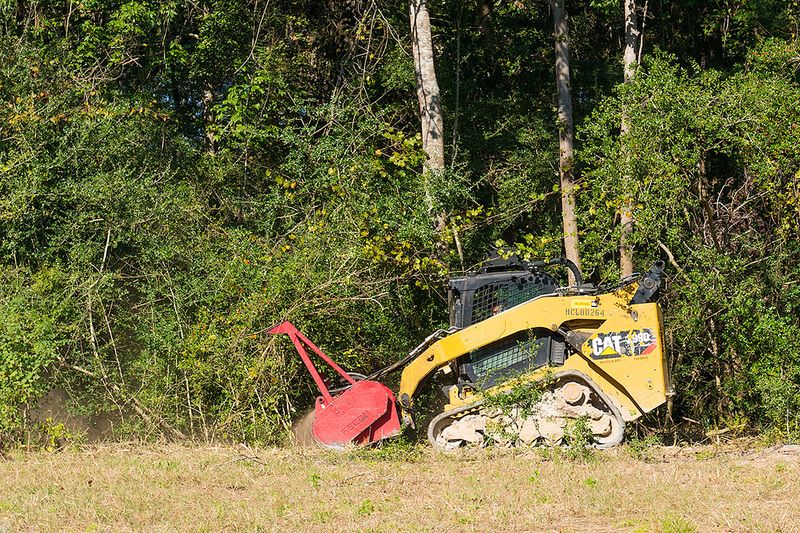 To discuss your particular situation and the various tree or brush removal options that we can provide, give us a call or send us a message through our contact form. We’ll get in touch with you promptly to provide an estimate unique to your needs.